The automotive industry is dominated by a vivid competition. Companies are looking for more convenient driver assistance systems to keep up with the demanding market. Most of assistance systems require an interaction with the surrounding traffic. As a result of the increasing complexity, extensive driving tests will be inevitable. The necessity to simulate real-life traffic includes the integration of numerous car fleets to create accurate driving situations. ITEF (Integrated Test and Evaluation Framework), a web based management toolkit, was created for the monitoring, the controlling and the evaluation of those driving tests. 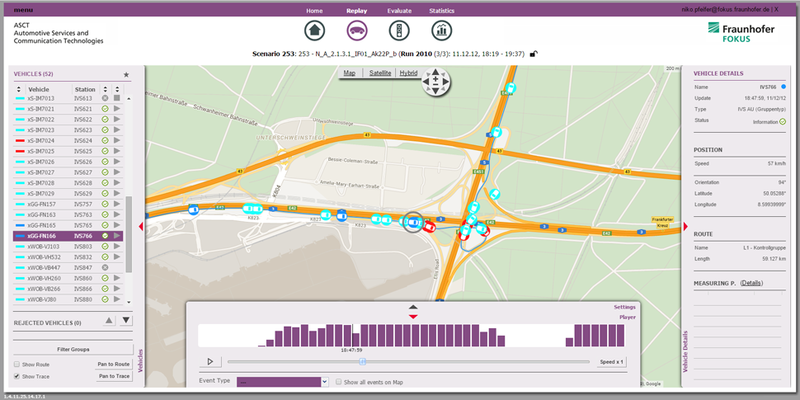 It controls and visualizes cars in a test run and moreover monitors the status of entire car fleets in a clear and assessable way. Our integrated Logging-Framework allows to collect log data and to store it centrally in a Big Data Backend. The Logging-Framework is easy to use, to integrate and it is also highly adaptive. Additionally, it gives the opportunity to evaluate the collected log data by using several tools, assisting the user to review, to visualize and to analyze the log data.